ConVirt allows you to create host private virtual networks. These are virtual networks that allows Virtual machines on the same managed server to communicate with each other without interfering with traffic from other virtual machines. 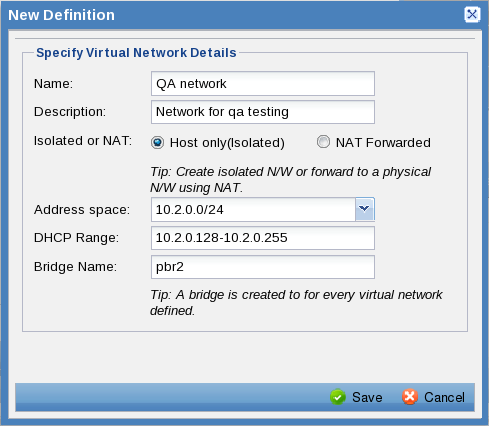 Here is step by step example of creating and using a host private virtual network. 2. Right click and select Manage Virtual Networks. 3. When you press ok. A new network is defined. At the time of provisioning virtual machine network interfaces can be associated with the network. Here is an example. 1. Select the managed server srv-001. 2. Right-click and select Provision Virtual Machine operation. Select the desired template and give a name to the virtual machine. 3 Now go to the Networks section of the wizard. You will typically see one interface with "Default Network" and Autogenerated MAC. Select this interface and click Edit. 4. This will bring up Network Details dialog. 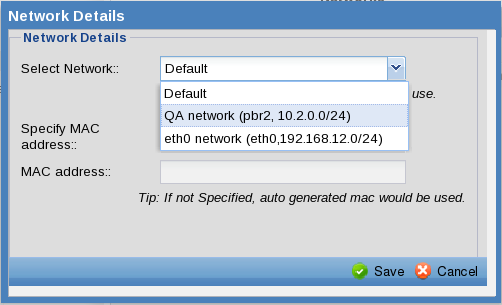 From the drop down select the "QA network" defined earlier and press save. 5. Now press ok to provision the new virtual machine.